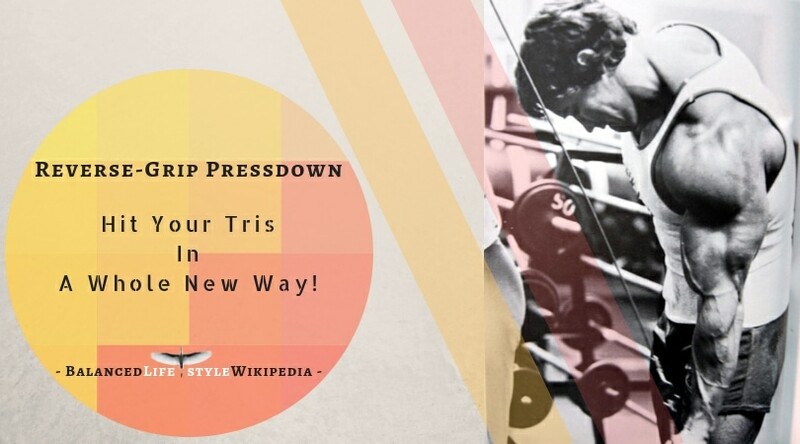 Body Building Reverse-Grip Pressdown – Hit Your Tris In A Whole New Way! Q: I’ve heard that the reverse-grip pressdown works the triceps lateral head better than the standard pressdown does. What’s the best way to perform this exercise? A: What you’ve heard is correct. Generally speaking, the medial head of the triceps does most of the work in elbow extension, especially at the beginning of movements. But in the reverse-grip pressdown, the most stress is placed on the lateral head, the big, beefy muscle that is seen in the upper middle portion of the back of the upper arm. This exercise not only adds variety to your triceps workout, but it also allows you to focus on the lateral head, helping you chisel some detail into your horseshoes. For that reason, it’s a great finishing exercise for triceps. Here’s the best way to perform it. Press down until your arms are completely extended and locked as you exhale. Hold for 1-2 seconds, then inhale as you return to the starting position. Keep your hands in line with your forearms – there should be no action or bent position at the wrist joints. Also, hold your spine in its normal curvature throughout the exercise. When training both arms simultaneously, use a short rotational bar – one that turns as you execute the movement. This will let you maintain the same grip and hand-arm position throughout the exercise.